Hey there, Cricut friends! It’s Cori from Hey, Let’s Make Stuff back with another Cricut Design Space tutorial for you! Today I’m talking about one of the best-loved features of Cricut Design Space: the Templates (previously called the Canvas). How do I know that this is one of the best-loved features? I wrote about the beta release of Cricut Design Space v3 here—and the launch didn’t include Templates. And boy, did I hear about it in the comments! Thankfully, Cricut quickly re-introduced these templates, which is awesome news for Design Space users. Templates are, fundamentally, what the name suggests. 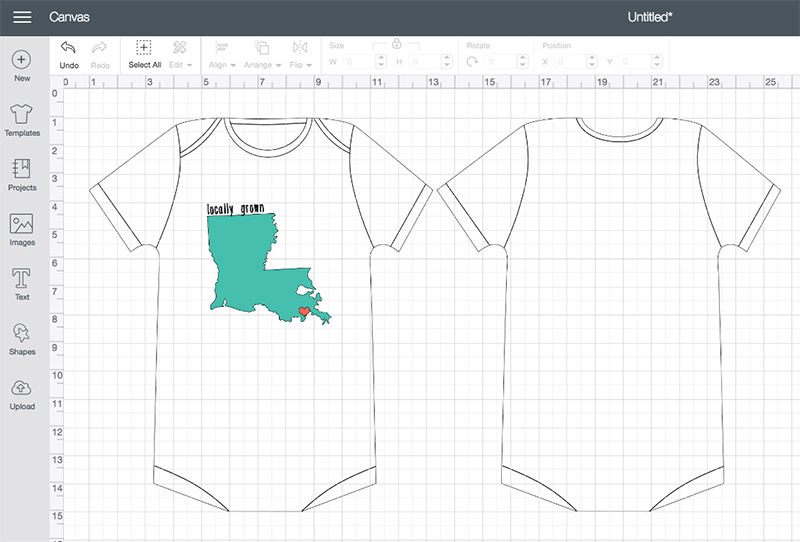 If you want to create a t-shirt design, put some iron-on vinyl on a backpack, add a funny saying to a wine glass, or decorate your locker, you can use one of the pre-designed templates to help you figure out what size you need for your project. I recently made fourteen shirts for a friend’s trip to a theme park. She has four kids, all different ages and sizes. I was able to use the Templates to figure out the best size to cut my iron-on for the shirts. This was SO much easier than eyeballing it or trying to use a measuring tape to guesstimate the size. Templates are found in the left sidebar menu in Cricut Design Space, second from the top. Open it up and you’ll be able to scroll through all of the templates. You can also use the search bar at the top of the Templates screen to search for something specific. Note that templates are only available in the desktop version of Cricut Design Space—they are not yet available on the apps. Templates are super easy to use. Choose your project and Cricut Design Space will insert it onto your canvas. I have inserted a baby onesie (under the pajamas category) onto my canvas. Now, this would be helpful in itself, but we know that not all onesies are created equal – they come in an array of styles and sizes. You might need a 0-3 month short sleeve onesie…or maybe a 12-month romper. Thankfully, it’s very easy to change the size and style of your project using the dropdown menu at the top of the screen.Note, you have to have your canvas selected in the right sidebar layers panel to see these dropdown menus. Now you can select the style and shape you want. If you want to select a color, just select the Template in the layers panel and click the color circle – here you can change it to whatever color you’d like, in the same way you’d change the color of any other shape in your project. Now you can create your own design using shapes and text, select a design from the Cricut Image Library, or upload your own design. I uploaded this adorable “Locally Grown” cut file I designed recently (you can get all 50 states here!). Then I was able to resize it to fit my onesie perfectly! If you want to select a color, just select the Template in the layers panel and click the color circle – here you can change it to whatever color you’d like, in the same way you’d change the color of any other shape in your project. NOTE: When you hit Make It for your project, it will just cut your design – not the template. This is fairly obvious when working with something like a onesie, but might trip you up if you’re making a set of banners or a luggage tag. If you need those sorts of shapes, you can always head to the Cricut Image Library and find something there! If you’re not a Cricut Access member, you should be—there are so many amazing images to choose from as a part of the membership. You can see from this example just how helpful templates can be when working on a project! Almost anything you can think of has a corresponding template—your projects are so much easier with this template feature! Which is your favorite template? Let me know in the comments! I use the card template all the time! I can make an image the exact size I want and put them where I want and rearrange to my hearts desire. I love it!! Awesome Kathleen! Before I knew about templates I would just draw a rectangle for a card, but the template feature makes it SO MUCH EASIER! Some of your card templates are not sized properly. Why are templates not available for mobile devices? I don’t know about how you can get Cricut Access outside the US, but there are tons of things you can upload yourself. Check out Dafont.com for lots of free fonts. There are sites that sell SVG’s too. Or you could get adventurous and learn Inkscape to create your own images. I have the cricut expression. I would like to make some rhinestone templates to use on tshirts. I don’t have a clue where to start. Help??? This is so advanced for me. I’ve just taken my Expression out of the box to make some invites. Unfortunately it won’t cut card stock paper. ERG. HOW DO I IMPLEMENT MY TEMPLATE INTO THE MACHINE TO CUT OUT. Hi. The template isn’t meant to be cut out; it’s to help you with proper sizing and placement on the item you are using. What template are you using? New to owning the circut air 2. Where do I find the templates? It’s in Design Space on the left side of the canvas. Can I change wording on a project I found in cricut design space? In some cases, yes It depends on how it was created. I’m new to cricut and have Air2. Does anyone know if I can change the size of a cricut project? I have selected a particular card template but want to shorten it so that it fits on my card stock. I noticed that the material sizes for this project is limited and larger than I want it. Is there a work around?? With some things, you can click on the padlock circle that appears on the corner when you select an item. This allows you to adjust the size as you like. Make sure you adjust other elements to match. You may want to do a test run before you use your project materials to make sure it will come out how you want it. I’m a new owner of Explore Air 2! About to design my FIRST iron-on. My question is: If my design is multicolor, do I put each color on a separate cutting matt? Or can I put all the colors on one matt and just make sure each item is placed correctly on the matt for each color location? Also, when I iron on the design, how do I decide which item should be ironed on first? Hi. You could possibly put the colors on one mat, yes. If you have an iOS device, the SnapMat is especially helpful. As for ironing on, it depends on your design. If you are using different vinyl types, look at the different temperatures needed and do the hottest ones first. Will templates ever be available to use with the apps? I am having a very difficult time with templates. 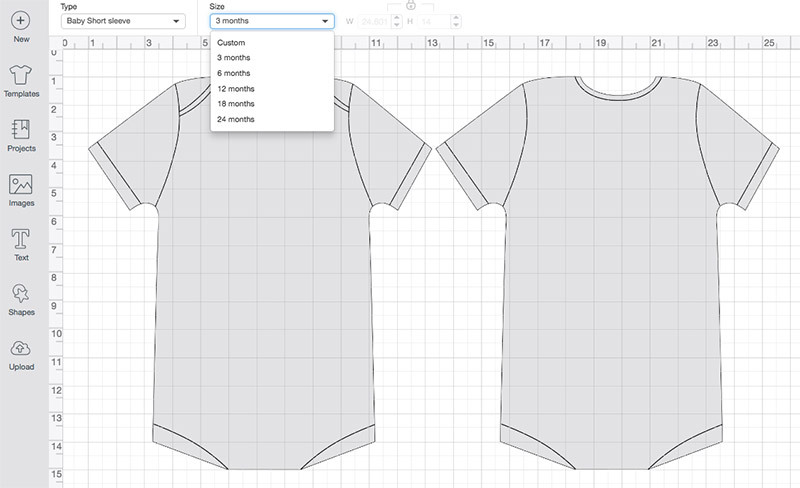 Trying to make 12 month, 2T, and 5T shirts and the image prints out WAY too SMALL after I used the template to help with sizing. Very disappointed. Also, the templates sized the 12 month design bigger than the 2T design. I am very new to Cricut. I just purchased my first Air 2. My question is do i need to make sure the colors that are showing on the design canvas correspond with the colors i am going to use on my project. Example i am about to do a project with Greek letters that show black but i am going to use green vinyl when i do the project. Hi. No, you don’t have to match. You can if you like. The different colors in Design Space are useful to help you sort out to the different mats needed for all pieces of the same color in your design. 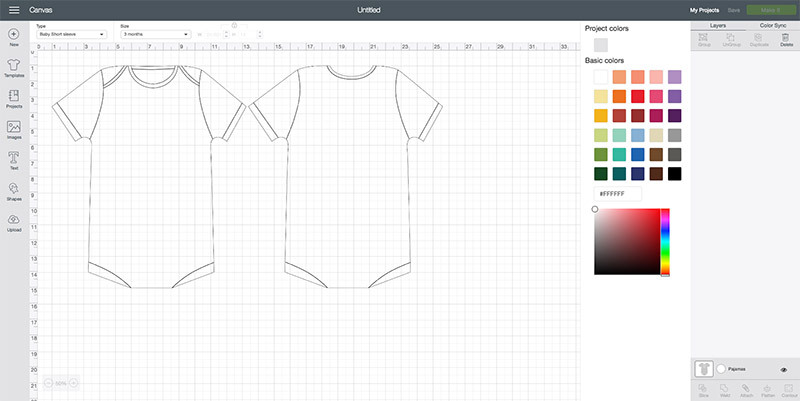 I love the shirts template I am visual person so it helps me when making a shirt to make sure the size looks good but also the colors go together well. I will say the kids sizing are off but the adults are great! thank you so much for bringing the templates back. Always measure before you cut. The toddler and baby templates are definitely not sized properly. Use them as a guide and arrange your design, but measure your garment and resize the entire project to fit your measurements.